Happy Day-After-Darwin-Day Day! Over the years, I’ve written lots about the world’s most famous biologist WHO WAS ALSO A GEOLOGIST DON’T LET’S FORGET. In honor of his special day yesterday, I shared links on my Facebook page to all the things I’ve written about him. Well, many of the things. All the best things. And now I shall share them here. Let’s start with some classic (or should that be, clastic?) Darwinian humor. Oh, yes, he had some wit to go with his wisdom! Did you know Darwin experienced a powerful subduction zone earthquake during the Voyage of the Beagle? We get so focused on finches that we forget he also did entire books’ worth of geology, and saw far more than just a few intriguing islands. He extensively explored the geology of South America, and Chile obliged his curiosity by showing him how some of it happens. Darwin on freethought: a tasty collection o’ quotes for ye. A fine Darwinian selection of geology quotes from the world’s most famous biologist. A Darwin Day mystery! Can you solve it? Our final Darwin Day selection: remember that Charles Darwin was a geologist from start to finish. 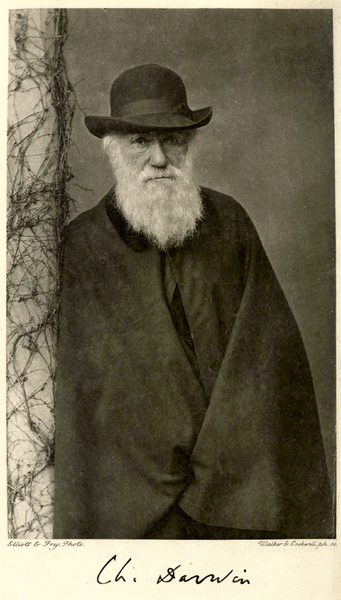 Charles Darwin, circa 1881. Photograph by Messers. Elliot and Fry. Via Wikimedia Commons. I must protest this disproportionate attention paid to his geology skills. How are we biologists supposed to feel about this erasure??? The most moved I’ve ever been by seeing an object was when I went to the traveling Darwin exhibit when it was at the Field Museum a few years ago. I was all “yep, yep, ok,” and then rounded a corner and saw his rock hammer. And I just stopped dead in my tracks. And stared. And soaked in that this was DARWIN’S ACTUAL ROCK HAMMER OMG. And tried to reason with myself that it was just a thing, that no thing is inherently special, but I just… couldn’t get over it. I still get a thrill thinking about it.